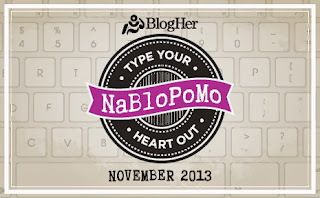 Having just finished a 31-day blog challenge, it seems a bit much to launch straight into National Blog Posting Month. But I'm hitting a writing groove, and I've done it for the last seven years straight. And I've got no shortage of material in my drafts folder. I'm not going to try to write every day in November; I don't think that's a wise goal at this point, with all the other stuff on my plate. But my loosely-held plan is to be here every weekday. Among other things, I'm determined to wrap up the love story series before the end of the year, and I've got a whole bunch more treasures to share. So stick around! And if you need some motivation to write, join in with NaBloPoMo. This will be way easier than 31 Days--you can write about whatever you want, not just a specific theme!